I had a couple of sorties at the beginning of this week. The objective was a bass but the outcome was zilch. Several other anglers were fishing on the same mornings as me and as far as I know no one even had a bite. 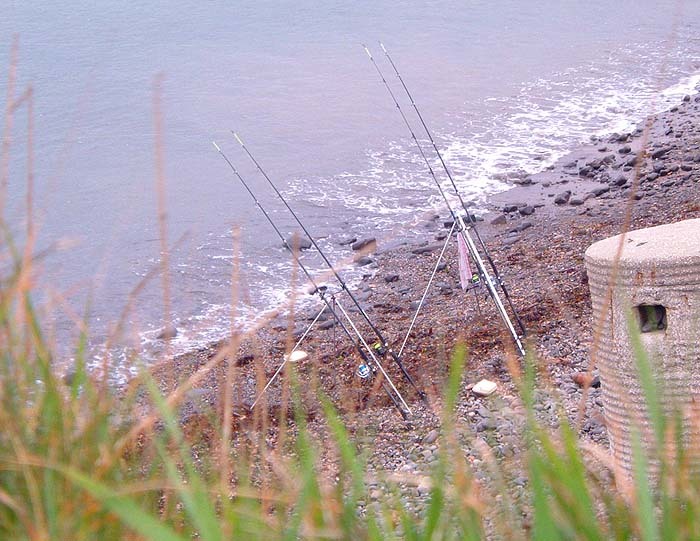 The weather was good, the sea looked fine the tide was OK but there did not seem to be any bass feeding. Perhaps we all went to the wrong spots but it seems unlikely. Perhaps we all used the wrong tactics but again it seems improbable. One of my pals emailed to say that he had also managed a blank from a good spot several miles along the coast. To confirm the poor state of affairs I spoke to two blokes with sleeping bags and four rods as I walked back on Sunday. They said that they had been fishing solidly since friday (there are people madder than me) and had caught only a wrasse and a rockling. Well, there's always next time eh! To cheer me up there was another long email from my friend Alan in New Zealand. At least he's still catching some fish (it's Autumn over there of course). I'll put a couple of his pictures and a few of his words in just to make it interesting. Isn't it amazing that I can find out what's being caught on the other side of the world within minutes? The morning dawned foggy and cool in Auckland. At this time of the year a foggy morning almost always signals a hot sunny day. The forecast for the weekend was for warm, settled weather but the Maori Calendar signalled 3 bad days and one fair. We left home around 10.00 am so that it was possible to fish the 2.00 pm low tide. The cloud burned off as we were travelling down to the coast and by the time I hit the mudflats at 12.30 pm it was stunning. Hot and sunny with a hint of breeze from the South East. I noticed there were a lot of small schools of bait fish (2 -3" long) huddled in the margins when I reached the estuary proper so I tied on a small Sassy shad in Black / Pearl as this looked a reasonable imitation. There was also a lot of splashy surface activity from small Yellow eyed Mullet and the odd 3' - 4' stingray (wingspan) cruising a beat in the slack water. There also was an occasional burst of activity as a larger predator harassed the bait fish. I cast and retrieved the soft bodied lure for about 45 minutes without a decent strike. The lure stopped a couple of times but there was a lack of teeth marks so I picked it for Kahawai or Yellow eyed mullet (YEM) attacking the tail of the lure. The next cast I noticed a YEM tracking the lure on the retrieve so decided to change to an L-minnow. Good decision. Within four casts two YEM were caught and released and in the next hour a similar fate befell 4 small Kahawai. Each fish was around 10" - 12" long. I took a photograph of one of the Kahawai caught on the L-minnow to give an idea of the size. Interestingly the Kahawai were also caught close together after the tide turned. Again there seems to be much better chance of hooking fish when the tide is running. Catching fish at dead slack water is very difficult. The best results came when I retrieved the L-minnow steadily. The speed had to be sufficiently fast to make the lure wobble and the rod tip quiver constantly. Too fast and the rod tip nods rather than quivers. I thought at one stage that I was going to be involved in a work up as a couple of large Kahawai charged into the bait fish about 75 metres away and the ever present seagulls took to the air and hovered in anticipation. Unfortunately it was all over before it really started and by the time I got there and had a few casts the scene was once again quiet and serene. The day dawned cool and overcast. The clouds held enough lead to signal rain before too long and there was already sea fret descending on the hills. Once again there was no rain and the breeze was non-existent. I was determined to go fishing, irrespective of the weather, to see if I could catch a larger Kahawai or Trevally so I took my spinning rod and a flyrod! Tim came with me and he rigged up his spinning rod with his favourite Berkeley Powerbait. There were not as many bait fish present when we got to the waters edge and they seemed to be feeding rather than huddled together for mutual protection. I attached a gold Eddystone eel to a longish trace on a fast sinking high density line and began casting across and down with the ebbing tide. A small Kahawai was hooked on the second cast but it managed to wriggle off as I struggled to strike and get the line tight. Lack of practice. Buoyed by the success, I continued to work my way downstream....removing shells snagged from the bottom by the fly on virtually every cast. Now I remember why I dislike fly fishing in the estuary. You have to be fishing the bottom to hook fish and when you fish the bottom every shell the fly passes wants to become intimately acquainted. This would not be so bad if the shells did not end up fraying the line immediately above the knot attaching the fly. I reattached the fly a couple of times and was getting weary of the process when a small Kahawai monstered the Eddystone eel. This time I was able to land the fish but unfortunately it has swallowed the eel. I managed to get the hook out without inflicting too much damage and decided to revert to spinning. A breeze had also started to gust in from the East which meant casting directly into the teeth of the gusts. I started spinning with an L-minnow and caught two small Kahawai in quick succession. 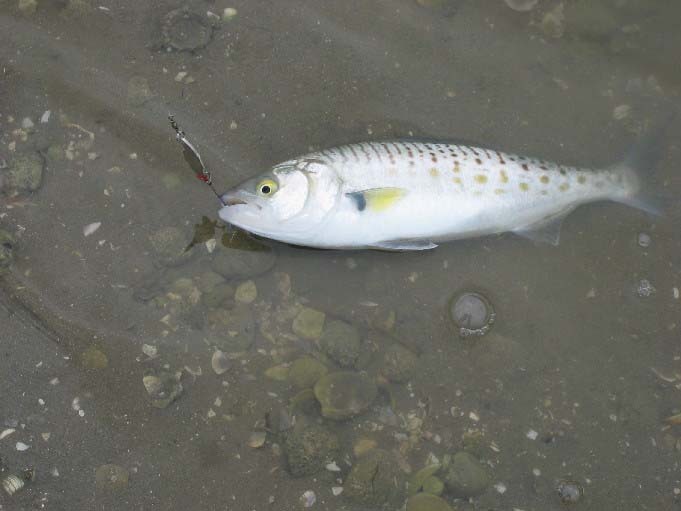 Things then went dead for about 45 minutes as the tide ebbed to dead low so I switched to a soft bodied lure (Northland minnow). 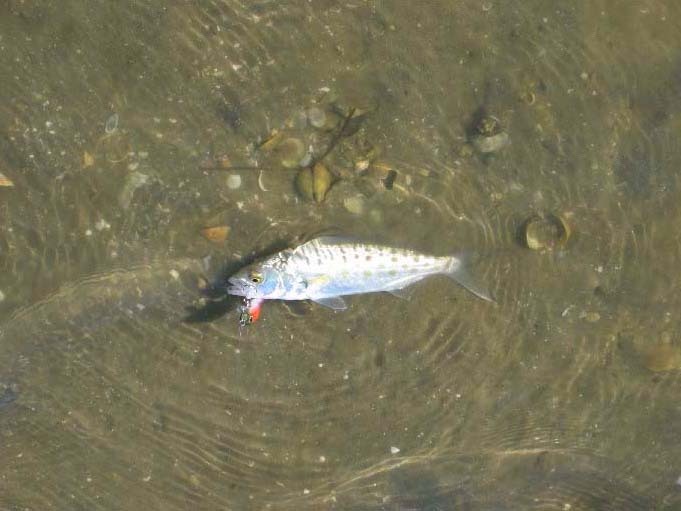 This lure was studiously ignored by every fish in the estuary in the 30 minutes it was attached. Tim fished steadily with his Berkeley Powerbait and hooked two small Kahawai, both of which threw the hook as they were about to be beached. I enjoyed reading that - didn't you?